Rear-end collisions are among the most common car accidents. One car is usually stopped at an intersection, and the car behind it fails to brake. Resulting injuries include whiplash, broken bones, headaches, lacerations and worse. The driver in front stops to make a turn, but fails to signal. The driver in front has brake lights that don’t work. The driver in front is having car trouble, but remains in a busy lane, with no hazard lights flashing. The driver in front has passed out from alcohol. The driver in front is having an argument on a cellphone. These are complex situations, and the rear-ended driver may not be wholly responsible for the collision that follows. But they illustrate the point that every car accident has its own unique features, and these features play a role in obtaining compensation. California is a tort state, not a no-fault state. This means that the driver who was negligent is responsible for the medical bills and other expenses of those who are injured by that negligence. If you are involved in an accident in Orange County, you want a law firm that is aware of these subtleties and up to date on other cases whose outcomes have a bearing on your case. In Santa Ana, a trusted firm is Chambers & Noronha. Our lawyers are experienced in resolving every kind of motor vehicle claim, including those that may involve comparative negligence. We are leaders in personal injury work in Southern California, knowledgeable and ethical, but firmly committed to maximizing your recovery. 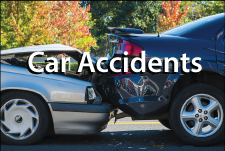 Whatever your accident type, call this number — 714-558-1400 — when you or a family member is injured by negligence. If you have a question, ask it, using this online form. You don’t pay any legal fees until we produce a positive outcome for you. Our attorneys offer initial consultations on a no-charge, no-obligation basis.